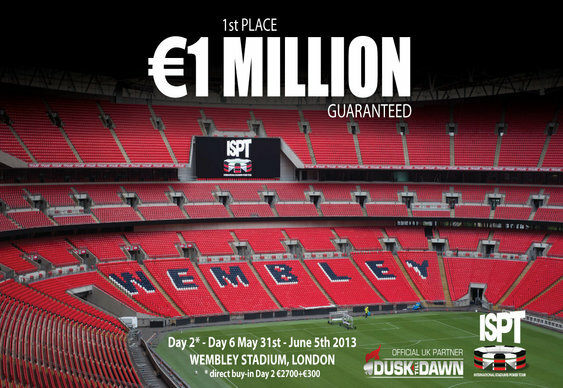 Another high octane day inside Wembley Stadium saw a slew of pros head for the stands as French qualifier Alban Juen claimed the ISPT lead with an impressive 5,265,000 chip haul. Starting out with 98 players still in the running for the €1 million top prize, Day 4 soon saw fireworks as the largest stacks in play clashed on a veritable “table of death”. Having started the day with the chip lead, German Ole Schemion looked intent on emulating his country’s football team by putting on a dominant performance inside the stadium. The young pro got that chance in an early battle with England’s Sam Trickett. After a series of bets and calls, the two players were faced with a board reading: 3s 6s 2s 2d Qs. With 260,000 chips in the pot Trickett made the first move by betting 92,000 with a ten-high flush. The bet caused a moment’s hesitation from Schemion before he called with Ac Ks to scoop the pot with a better flush. Having lost almost half his stack to Schemion, Trickett soon lost the rest of his chips before donating his €3,000 winnings to the dealers and heading to the airport bound for Las Vegas. Big name eliminations soon became the norm as the likes of Toby Lewis, Matt Frankland and Schemion all faltered before the close of play. However, for every hopeful who lost their stack another was there waiting to scoop it up. Indeed, as the final 20 players took a well earned break ahead of today’s penultimate session, the likes of Nick Hicks (4,785,000), Pete Linton (4,515,000) Dave “Devilfish” Ulliott (1,700,000) and Freddy Deeb (1,485,000) are all still in contention.